Illinois Prairie corn chowder soup mix. I made this a few weeks ago and it was delicious. 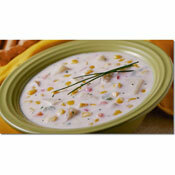 I had eaten real Corn chowder in a restaurant in Medora, North Dakota many years ago. This tastes as good as I remember that being. A good buy, with flavor you can appreciate. Yum Yum. 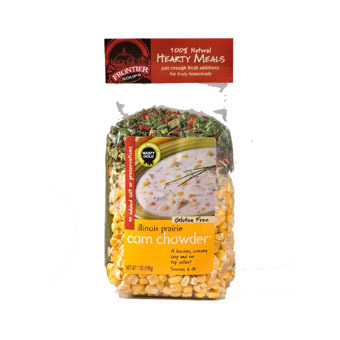 Frontier Soups' Illinois Prairie Corn Chowder is the top-selling soup mix in The Savory Pantry. A luscious, creamy and versatile family favorite, the corn chowder only takes 10 minutes to prepare and 45 minutes to simmer on top of the stove. 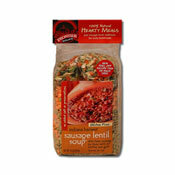 Simply combine with a few ingredients for a delicious meal. 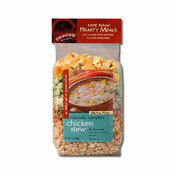 Air freeze-dried corn, rice, onions, celery, carrots, red pepper, chives and herbs. Contains no added salt, preservatives or MSG. Trisha Anderson, President of Frontier Soups, never had any intention of starting a business. Trisha got her start when she came to the rescue of a friend who was organizing a local holiday market. "She knew that I had done some catering and was curious if I had a 'product,' says Trisha. "I told her that I had this bean soup mix that might work." So Trisha went to the show with 275 hand-packaged bags of soup and her card table. She sold out the first night. Thus the beginning of Frontier Soups. 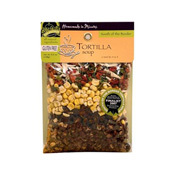 Now, more than twenty years later, Frontier Soups offers the finest soup mixes on the market ~ soups for all seasons and all appetites.